Starmobile released its quad-core phablet, the Diamond V3, today at Php 8,990.This 5.3-inch device wraps an FWVGA display and will be available in Starmobile kiosks nationwide. Specs-wise, Starmobile Diamond V3 throws in a Qualcomm 8225Q 1.2 GHz quad-core processor with Andreno 203 as its main graphic procesor. It is also packed with a 12MP rear camera with Back-Side Illumination (BSI) Technology for a legit low-light outputs. On the front-panel, you will see the 2MP camera which is capable to keep up with your video calling needs. 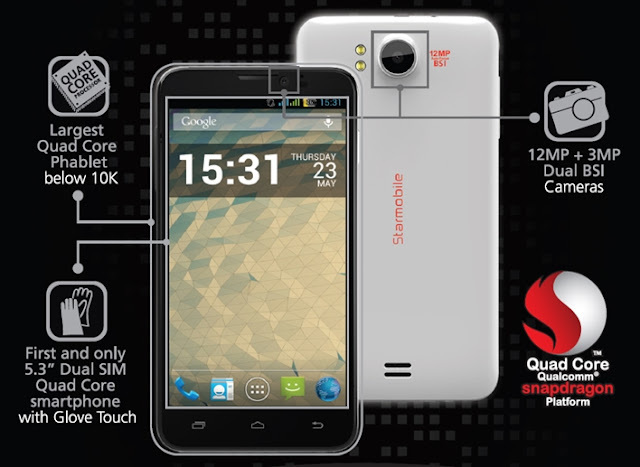 Other essentials include the Android 4.1 Jelly Bean, 2100 mAh battery, 4GB internal memory and 1GB of RAM.Starmobile offers a 8GB microSD card, a screen protector and a case when you purchase this device. For those interested, you may check the complete specs below.